Although the IDF itself has yet to comment publicly on the strike, reported by Syrian sources in the early morning hours of 7 September, one analyst has now presented post-strike imagery that appears to show strike damage at a special weapons facility northeast of Masyaf, Syria, in Hama Province. Initial reporting on Thursday was unclear as to which facility in the area had been hit. The site northeast of Masyaf was most likely, given its relatively long history and connection with Syrian special weapons programs. But there is a separate Syrian Scientific Studies and Research Center (SSRC) campus in Masyaf, which some news outlets implied had been the target (i.e., by using satellite imagery of the campus in their reports). And one of the new missile factories being built by Iran in Syria and Lebanon is also near Masyaf, some 15 miles west of it. Some commentators speculated that the Israelis struck that facility on 7 September. The imagery GIF posted on Twitter by Qalaat Al Mudiq seems to indicate, however, that the strike did target the slightly older facility northeast of Masyaf. NW. #Hama: #Israel|i airstrikes hit last night a Scientific Research Base near #Masyaf, despite presence of nearby Russian air defense. The facility isn’t all that old. Syria has had chemical weapons and missile programs for decades, but this facility was still in a rudimentary state 10 years ago. An imagery series posted by the Institute for Science and International Security in 2010 showed the compound still in development in 2006. And comparison of the 2010 images with the facility’s condition in 2017 indicates that it remained a work in progress. But the Institute assessed in 2010, based on logistic traffic between the sites, that manufacturing work at the Masyaf site probably had a connection to the Al Kibar site in eastern Syria where the plutonium reactor was struck by Israel in 2007. This link may or may not have related directly to the nuclear weapons program; what it does seem to confirm is the Masyaf site’s connection to Syria’s special weapons portfolio, which is controlled by the SSRC. The IDC Herzliya report didn’t indicate that the Masyaf compound was used for manufacturing. But alterations at the facility prior to 2017 do suggest an expanded role for it in the years since. 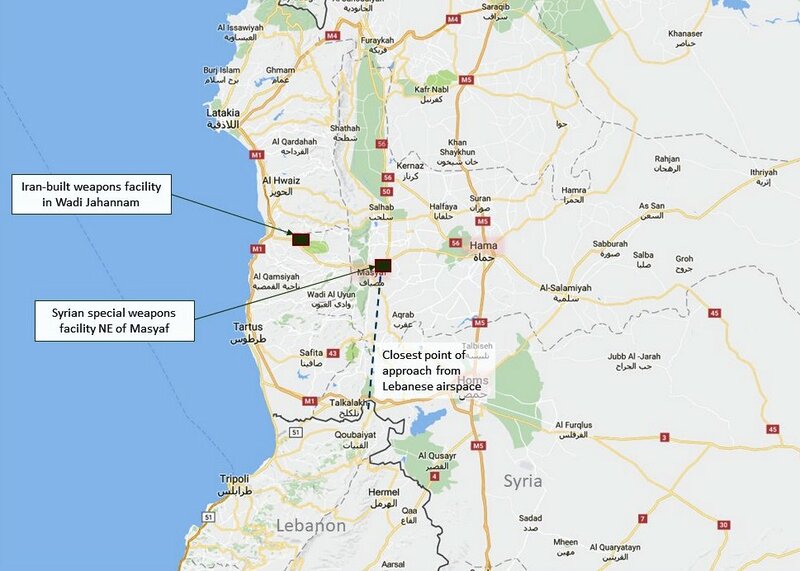 In a widely quoted tweet series on the strike, Major General Amos Yadlin, former head of IDF military intelligence, said that the target struck at Masyaf was involved in manufacturing precision missiles and chemical weapons, including the barrel bombs deployed against the Syrian populace. 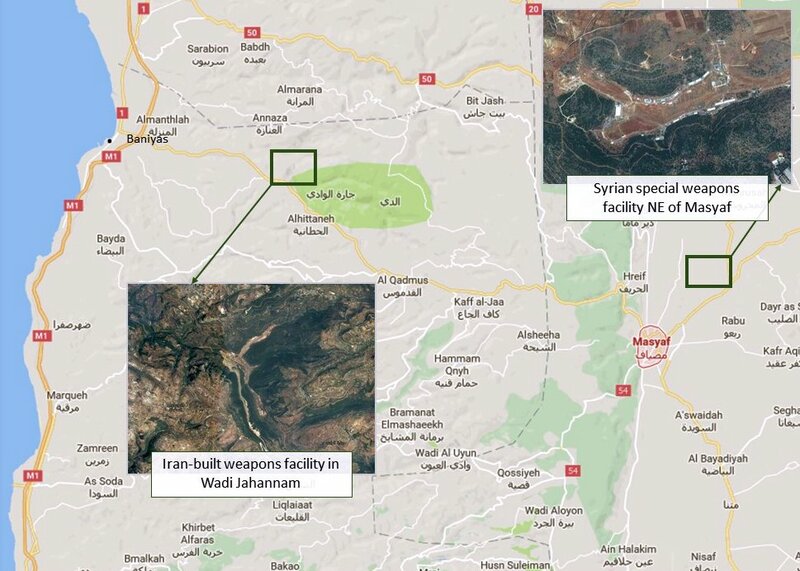 Israel Hayom quoted the Syrian Observatory for Human Rights as saying that Hezbollah representatives had been present at the Masyaf site “more than once,” and that a military camp next to the weapons compound is used to store ground-to-ground rockets. Major General Yaakov Amidror, a top analyst at the Begin Center, also focused on Hezbollah, suggesting that in Hassan Nasrallah’s visit to Damascus last week, he may have lobbied for the weapons facility to be given to the terrorist group. The implications of that concept are worth a whole separate post to explore. But ultimately, it is even more interesting that General Yadlin had such a different emphasis: on the moral aspect of Syria’s use of chemical weapons, and the enforcement of Israel’s red lines. These are two of the significant points made in what was obviously a carefully thought-out sequence of tweets. The exceptional discipline and polish of the tweet series is arresting, coming off like a set of approved talking points. But it is admirably subtle as well, in that casual readers might not pick up on the most important point conveyed in Yadlin’s tweets. Put more bluntly, Russia’s interests in Syria, and effective control of Syrian airspace, will not hold a veto over Israel’s strategic latitude. The somewhat cryptic, unexplained statement in the very first tweet is the key. The strike reported last night is not routine. And it appears that it wasn’t routine. It wasn’t like previous strikes on targets in Syria – because it was brought off in spite of Russia’s control of Syrian airspace, and the challenge an IAF strike represents to that control. There’s more to that point than meets the eye. If your reaction is that we already know that, bear with me here. Israel has attacked targets like the Masyaf facility before – even with the Russians operating air defense systems for Syria – and has launched attacks from standoff positions outside Syrian airspace before too. 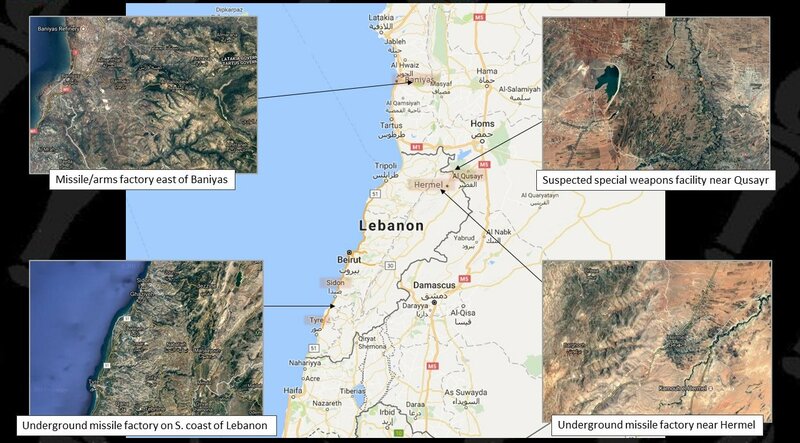 Reporting from Lebanese and Syrian sources indicated that the 7 September air strike was made by Israeli jets firing from Lebanese airspace. That’s one of the important aspects of the event. Another is that it was clearly a precision strike (the target type would require that), made apparently for interdiction purposes; i.e., not just to mess with the function of the targeted system for a while, but to destroy a lot, and put it out of commission for some time. For a strike like that, the best option for effectiveness is precision-guided bombs (e.g., 500-, 1,000-, or 2,000-pound warheads, with JDAM or Paveway guidance packages). That would mean flying the aircraft all the way to the target – into Syrian airspace – which apparently didn’t happen in this case. Although it’s not the ideal weapon in terms of weapons effectiveness, the IAF can also use the much longer-range Popeye cruise missile to attack targets like the Masyaf facility. That doesn’t appear to have happened either. Popeyes would have launched from further away, with no necessity for the Israeli aircraft to overfly Lebanon as close as they came to the Syrian border. Observers in Lebanon would, if anything, have seen cruise missiles overhead; they wouldn’t have heard the strike-fighters, or seen them overhead. 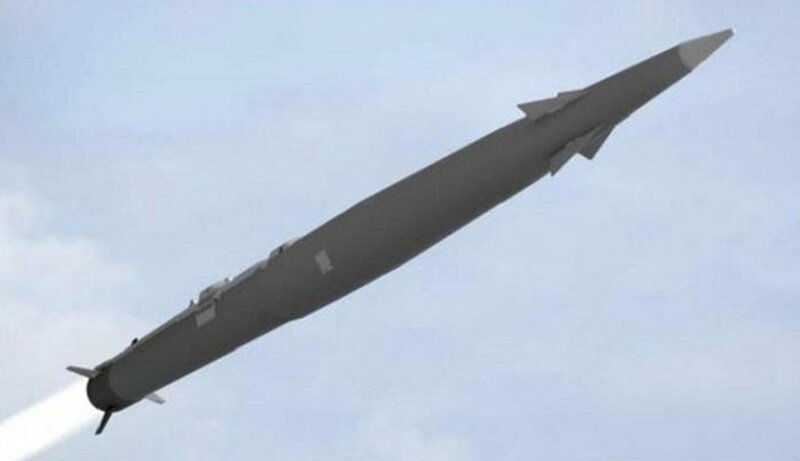 Another potential option would be a standoff precision-guided bomb system, like the GRU-39 Small Diameter Bomb (SDBs) or possibly the Israeli-developed Spice, either of which can be launched from far enough away to reach the target in this scenario. I consider this option doubtful, however. For another, these modern bombs have to glide to the target. For airspace defended by modern systems, the distance from the Lebanese border to Masyaf (about 22 miles) is a long way to have to glide successfully – and requires the delivery aircraft to be at high, vulnerable, and specific altitude at the point of launch. Getting a cruise missile like Popeye through airspace defended by modern systems would also not be a sure thing, it must be noted. The delivery aircraft can launch from a safe distance, but the missile itself is trackable and vulnerable. An unusual report posted by a Twitter user may help us narrow down what did happen. In a text received by the user from an on-scene observer, we read that what the observer heard when the jets were overhead sounded like a multiple launch rocket system (MLRS) in operation. None of the options mentioned above would create that sound. The weapon system is the SkySniper. Introduced in 2016, it is an air-to-ground rocket with a comparatively long range; unstated, but probably in excess of 100 miles. An F-15 or F-16 could carry four at a time. The warhead could be up to 1,000-pound class, perfectly adequate for the job at the Masyaf weapons facility. The weapon can rely on GPS/INS guidance all the way to the target. In a video published by the company…it can be seen clearly that the missile soars after launch and gets in an almost vertical attack angle toward the radar station. There is a very good chance that the Russian S-300/400 operators in Syria, while they could see the Israeli strike-fighters throughout their entire flight profile, were unable to resolve a target solution on the weapons the IAF jets launched. Their system might not have even recognized them. And that’s not a deficiency Russian air-defense designers can repair quickly. If Russia wants to interdict in that scenario, her operators will have to shoot down the IAF jets themselves, outside Syrian airspace. 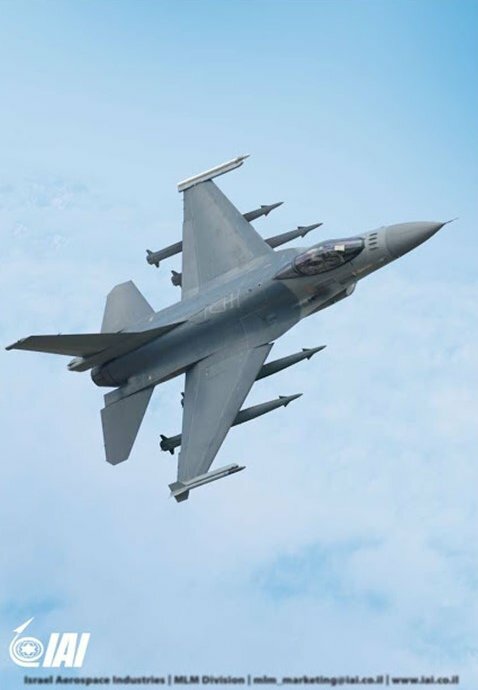 But note: unlike the standoff guided-bomb scenario, the IAF jets are not constrained by the nature of the air-to-ground weapon to operate in a vulnerable way. The message such an event sends is that Israel can get done what she needs to, even without Russia’s tacit cooperation. It’s not difficult to think through the implications of that, or deduce why now – with the final battle for control of Syria beginning – would be the time to send such a message. This passage has been widely quoted in the weeks since. Meanwhile, at the Snafu website (link above), blogger “Solomon” asked last year what the point of developing the SkySniper was. I wonder what the thinking is? Low cost so that they can shoot many of them, high speed so they have less of a chance to be intercepted, and long range so they stay outside the range of enemy air defenses…I get all that, but I didn’t think there was a market need for such weapons. After all the Small Diameter Bomb supposedly does this job already. But the SDB doesn’t do what the SkySniper may have just done – assuming that’s what the Israelis used against the Masyaf weapons facility. A weapon that can keep Israel in the preemptive self-defense interdiction game, even when a modern, layered air defense system anchored on the S-400 lurks next door? I suspect Solomon may have the answer to his question. J.E. Dyer is a retired US Naval intelligence officer who served around the world, afloat and ashore, from 1983 to 2004.